Whether you simply like a filter coffee of a Sunday morning or you’re a coffee aficionado who can’t leave the house without their morning espresso, a good coffee mug makes all the difference when sipping on your favourite hot beverage. 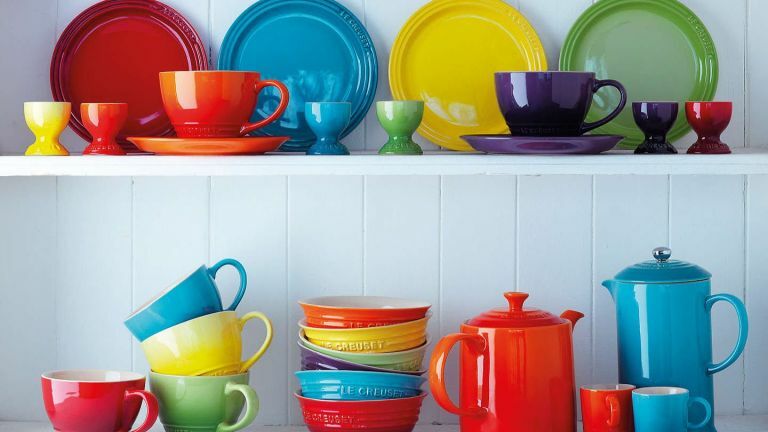 Most of what you’ll be looking for when picking a coffee mug is whether it looks pretty or matches your kitchen. The most common coffee mugs are made from stoneware or china but you can also get latte glasses for a true coffee shop feel, or plastic and stainless steel for drinking alfresco or portability. Check out our round up of stylish coffee mugs from unique and individual mugs to classic sets that can be displayed on your kitchen counter. Which one will be your favourite? Start your day right with these rainbow espresso mugs. This set of 6 colourful mugs can hold up to 10ml of coffee, the perfect size for a shot of espresso and they sit neatly under a coffee machine. They are quite pricey for such little mugs but for families who are coffee obsessed, this set of mugs can provide everyone with a colour coordinated caffeine shot in the morning. Customers have said these make the perfect wedding present for caffeine lovers. If you need a new set of coffee mugs for when friends and family come over for a cuppa, then these Denby Elements coffee mugs are both practical and stylish. Some have said they would prefer these mugs to be bigger; however at 330ml they can hold a standard sized cup of coffee or tea. They have a delicate speckled design but have been glazed to prevent chipping which means they are easy to clean in the dishwasher. Copper is really popular at the moment and these stainless steel coffee mugs in black and copper are designed with style and functionality in mind. Not only do they stand out from the crowd but their material is perfect for insulation, meaning your coffee will stay hotter for longer. They’re also incredibly durable, so these are safe for use both indoors and outdoors; as daily mugs or travel mugs when you go on a camping trip. If you’re looking for something quirky as opposed to your bog standard coffee mug, then you’ve come to the right place. Some people prefer drinking their coffee out of a glass, and these glasses with a cork band are specifically designed to keep your coffee insulated and they are super comfy to hold. There’s only two in a pack so if you like to have friends round for coffee they’ll likely to fight over who gets this funky coffee glass. There is nothing better than holding your coffee close on a cold day, and with the large, round mug and large handle, there’s plenty of room to get a grip on it and keep your hands warm. This mug doesn’t come as a set, but if you want to treat yourself to a fancy mug for using at work, then this could be just the right size for you. It claims to be dishwasher safe, although with its delicate design we personally wouldn’t risk it. If you need a gift for someone in the office, then a coffee mug is usually a safe bet. This novelty coffee glass has writing on the side which indicates levels including “go away”, “not yet” and “how can I help you?”. Some users have said the writing is fainter than expected, but it is still visible nonetheless. This glass also means your coffee will stay hotter for longer, so all in all, people rate this a great gift idea. If you’re going to drink a latte, drink it right. This set of 2 tall coffee glasses are designed for drinking the popular milky coffee, and will keep your drink hotter than a stoneware mug would. These glasses are very affordable for a set of 2 and said to be very durable and have no problems going in the dishwasher. The only niggle with these types of glasses is the handle is very small which can make holding hot coffee a little tricky. It can sometimes be tricky to get your morning coffee fix when in a rush, but that doesn’t mean you have to buy a Starbucks every day. This travel coffee mug allows you to press your coffee on the go, for a hot beverage exactly when you need it. You simply add hot water to one compartment and coffee grounds to another, and then push the filter down to mix the drink. Some have said you sometimes get coffee grounds left at the bottom of the mug, but other than that you get tasty coffee that stays hot and is impossible to spill with the handy lid. Pick up a set of our top-pick coasters on hand to keep stubborn cup rings at bay.